For Those Who Want Only The Best! Superior Strength. Hercules is the Ultimate Panel Wall Pool made of the finest quality materials. 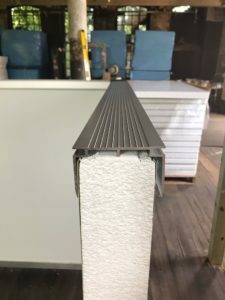 It is built with solid insulated panels that are much stronger than polymer, steel and concrete. Its 3″ thick walls have a 2-lb. 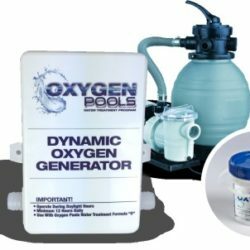 density while other similar pools have 2″ walls with a 1-lb. density. Hercules has an all-aluminum, extra heavy duty, anodized frame that is ideal for above, semi and in ground applications. 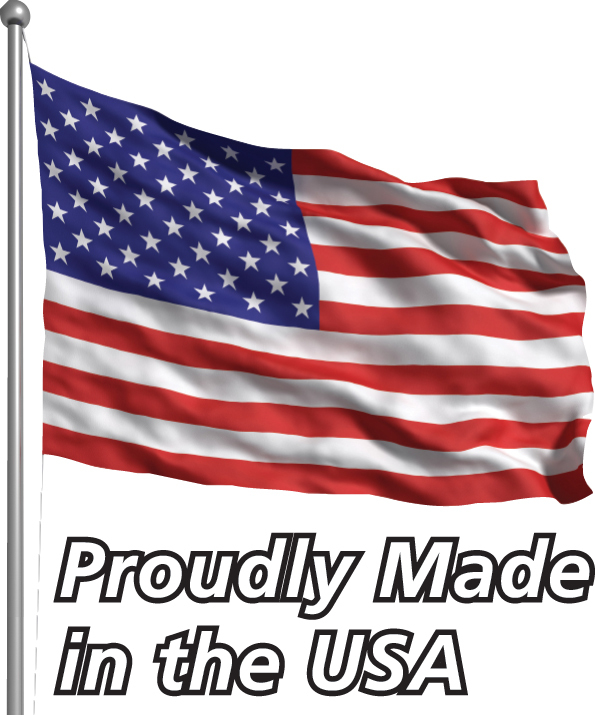 It is proudly made in the USA, using the same engineering technologies that build various airplanes, skyscrapers and spacecraft. Maximum Heat Retention. Hercules walls have an expanded polystyrene thermal insulated inner core with a double outer layer of galvalume skin. It is the only swimming pool wall that has a continuous thermal run and an R-14 (insulation) value. 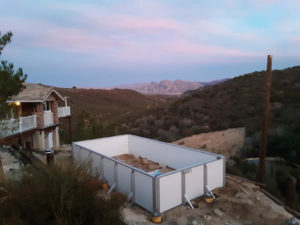 This is 50% greater than other panel wall pools that have an R-10 value. The end result is major savings on heating costs. Easy Assembly. Smart design of our Hercules is very installer-friendly. All walls, corner posts and buttresses are preassembled. We pride ourselves on innovation and simplicity that will benefit the end user. Hercules swimming pool requires only 8 Steps to assemble and actually stands up when being erected. 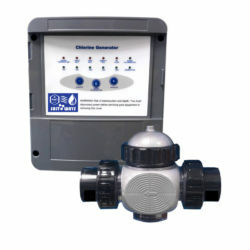 In fact, Hercules can be installed by just one person and this will save you major money on installation. Maintenance Free. Hercules swimming pool will resist oxidation, will not rust or tarnish, will never warp or crack. 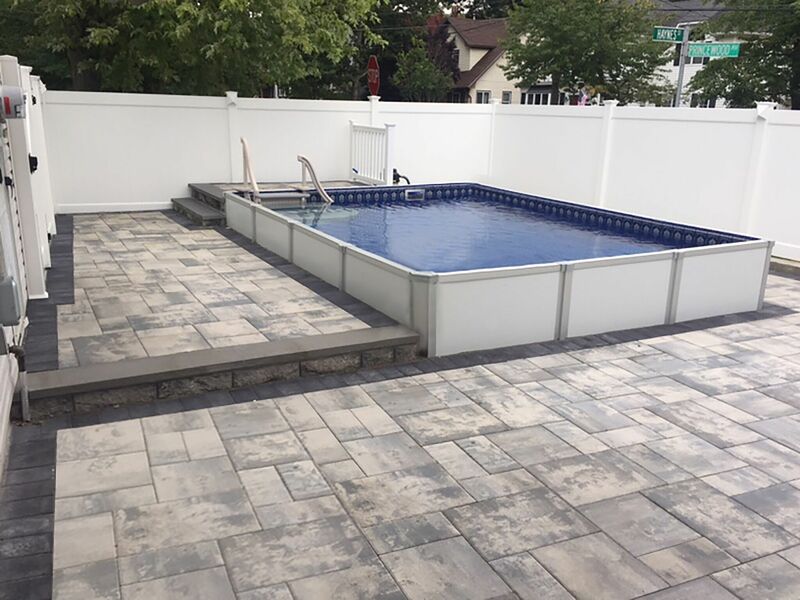 This swimming pool is noncorrosive and virtually maintenance-free. It is built to handle extreme weather conditions. Up-Scale Aesthetic Appeal. 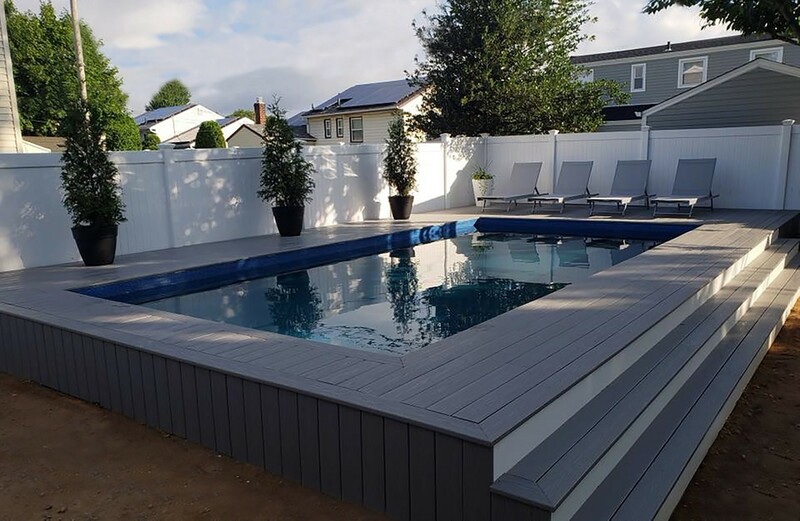 Hercules swimming pool has a neutral Polar White color which will compliment and enhance all landscapes and backyard terrains. Environmental Attributes. our commitment to energy efficiency, sustainability and environmental responsibility is evident in our Hercules swimming pool. The insulating panels of this swimming pool earned points based on the requirements of the U.S. Green Building Council’s LEED (Leadership in Energy & Energy Design) Green Building Rating System, and is also qualified under the National Institute of Standards and Technology’s BEES program (Building for Economic and Environmental Stability). Tax Incentives. Swimming pools installed with concrete are permanent structures. And as such, they will be assessed annually, increasing real estate taxes. 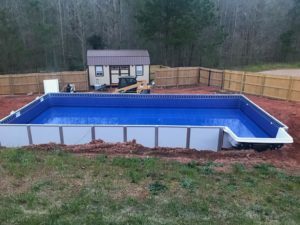 Hercules above and semi inground swimming pools are temporary structures and do not require cement to install. As such, they are not subject to the above real estate taxes. Transferable Lifetime Warranty. The components of the Hercules swimming pool are crafted using the best quality materials, backed by proven manufacturing methods, proud dedication and years of experience. We are so confident in Hercules’ strength, durability, and longevity and, therefore, we provide our customers with a fully transferrable Lifetime Warranty. More Options. 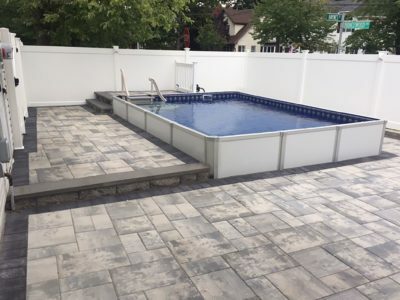 Hercules swimming pool accommodates many upgrades and options such as concrete walkways, pavers, swimming pool lights, walk-in steps, walk-out stairs and much more. 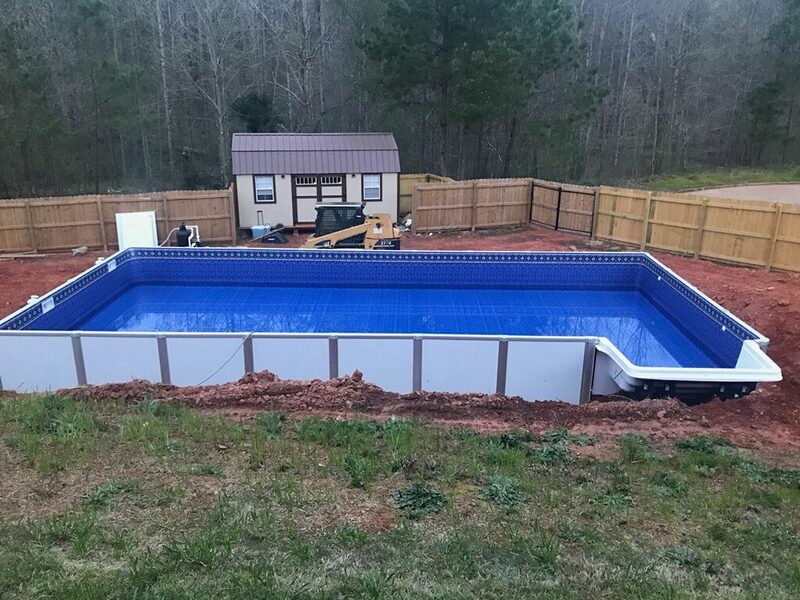 Unlimited deck options are also available for your Hercules swimming pool. Up-Graded Liner. A 25 mil swimming pool liner is included with your Hercules pool! Perma 25 liners offer you the highest grade material with extra UV inhibitors for maximum resistance to chemicals, bacteria, sunlight, fungus, and cold cracking. 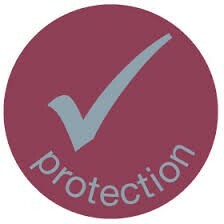 100% Virgin Vinyl, 25 Year Manufacture’s Warranty. Hopper Liners. 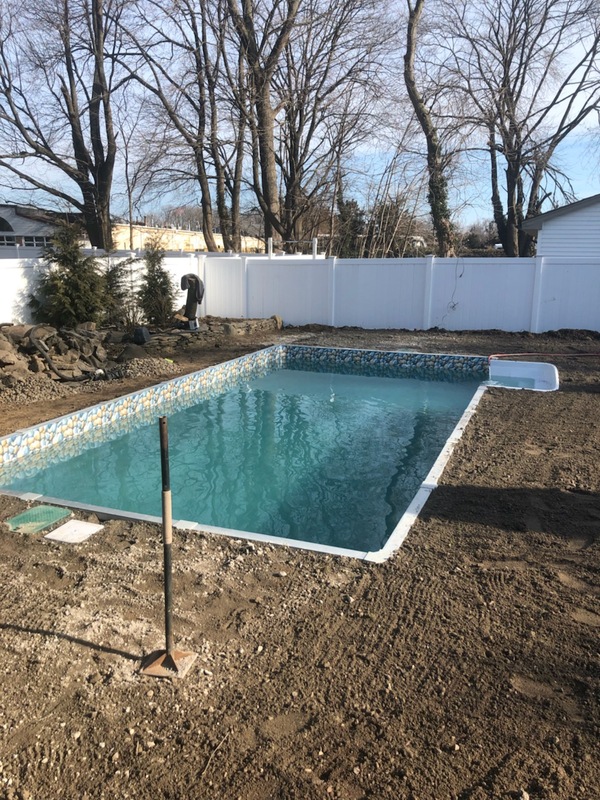 if you desire a deep end, a hopper liner can be ordered, hopper liners are installed according to a special diagram that details the exact dimension for excavation of your pool hole, liner is made to conform precisely to the specifications on your dig sheet. Custom Design. Your Hercules pool can be manufactured to order. 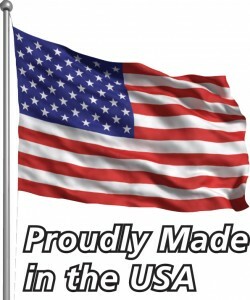 Working with 4 ft panels, any rectangular size can be customized for you working with 4ft length or width variations. Just tell us want special size you need for you pool project. Decking. 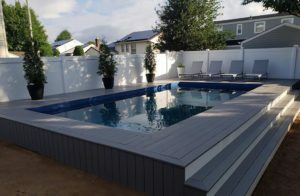 Your Hercules pool can be ordered with decking. 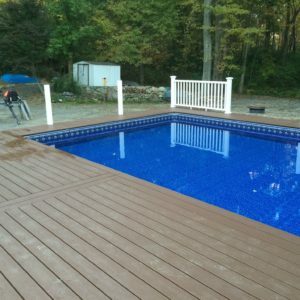 Easy installation to the pool, decking can be painted, stained or shellacked. Self closing, self latching, lockage gates are provided. 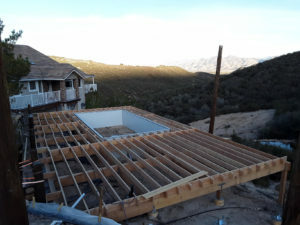 Custom decks can also be ordered in 4 ft increments. Decks are manufactured with strong treated lumber similar to that of most house balconies and outdoor patio decks.